Paypal’s small business lending division has supplied more than £400 million of credit to 22,000 British companies since the service was launched in 2014. The American online payments giant said Paypal Working Capital was filling a “funding gap” that traditional lenders “can’t be bothered” to service, with research showing that a third of its loans have been provided to small companies based in areas that have lost 50 or more high street bank branches in the past four years. Paypal said there had been a 116 per cent increase in “cash advances”, a form of unregulated factoring it has provided for the past 12 months, as the service grows in popularity. It said that it had found a niche among “younger, smaller and online businesses with less conventional business models or established sales histories that can struggle to fit traditional lending criteria”. While the amount of credit it has provided so far is still dwarfed by traditional bank lending, Mark Brant, managing director of Paypal UK, said that the company, which holds a European banking licence, expects to expand the service. In a statement of intent that may be of concern to traditional lenders, he said Paypal will consider launching further financial products for small businesses and consumers. “We continue to look at consumers and merchants to identify gaps. I’m sure in the future there will be other products coming out. Rather than traditional credit checking or accounts, Paypal crunches data on sales through its platform to decide whether or not to offer small businesses “cash advances” of between £1,000 and £100,000. Customers must have at least 90 days of sales history on the platform. The credit is paid back as a fixed proportion of turnover, so debt is settled more quickly when a company is performing well, and more gradually during lean periods. Since there are no credit checks, the advances can be approved and in customers’ accounts in minutes. The fee depends on the size and length of the credit line agreed, but normally is between 5 per cent and 10 per cent of the total sum. While the most common use of the funding is to invest in stock, Mr Brant said the credit has also been used to buy manufacturing equipment and to upgrade office premises. Mr Brant said the service had found a sweet spot among those who are overlooked by finance providers. “We’re very responsible with our advances, but we’re lucky that we’ve got data and existing customer relationships that other lenders don’t have. That enables us to advance funds to companies that have struggled to get funding elsewhere, and equally those who have struggled with the application processes, the effort you have to make, particularly for smaller amounts. Some lenders can’t be bothered with making the effort for smaller advances. We can make an advance of [as little as] £1,000 which make a real difference. “Banks do a tremendous amount to support small businesses. We’re trying to find new ways to serve the customers where other providers are falling short. It’s about filling the gaps. “It appears there’s a link to where the banks have pulled out. A lot of small business credit products require you to go into the bank and have a conversation. If your local bank is no longer there, who do you have a conversation with? We’re seeing a link between our application process being so easy and areas of the country slightly more affected by bank closures,” Mr Brant added. Mel Thomsett is one of the entrepreneurs that has benefited from this relatively new form of online finance provision. The 48-year-old established Sensory Smart Store in 2009 to supply socks to those, including her own son Archie, who struggle with conventional clothing because of medical conditions. Archie has autism and, Ms Thomsett says, related problems with sensory processing, where his brain struggles to interpret information it receives from the senses. “It’s really hard to imagine not being able to put a sock on to a child, it was like I was trying to put his feet into boiling water,” she says. Sensory Smart Store sells its often seamless clothing to markets across Europe, including France, Sweden and Norway, and as far afield as Singapore. She started the company because it was proving difficult to fit a job around the care needs of her son, and to provide a source clothing for other parents in a similar position. When she wanted finance to expand the New Forest-based business, she hit a snag. “I knew I needed a capital injection. The problem I was having was, I’ve been a carer for ten years, I’m now a single parent. As far as finance is concerned, I don’t really exist on anyone’s charts any more as being a good risk for anything. “If I’m going to go to the bank, I need to dig out my professional clothes which are hung at the back of the wardrobe. The whole process of getting capital into your business if you’ve got a company that isn’t traditional is quite alien. In order to fulfil the criteria, I would have to try and be something I wasn’t. 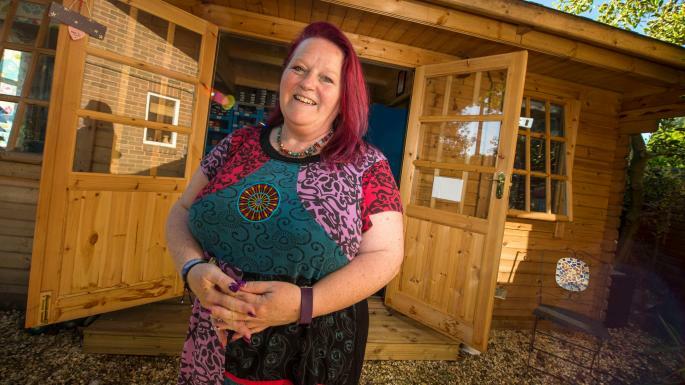 Ms Thomsett has borrowed a combined £49,000 from Paypal Working Capital over three advances, using the money for stock and also to professionalise the business by moving it off her dining table and into a purpose built office in her garden. She is investigating whether the company can manufacture its own products, and warehousing space that could provide work for autistic adults. Ms Thomsett said: “Paypal can see the truth of my business. It was a totally different experience. If I was taking a risk, and it went really well, I would pay [the debt] off really fast. If it didn’t go so well, I’d pay it off more slowly. “I want to carefully scale the business up now,” she said, adding that she hopes to grow what she admits has been a “lifestyle business” into something more substantial. With other technology companies, including Amazon and Alibaba, the Chinese ecommerce business, offering similar data-led credit services to merchants, traditional small business lending looks primed for an overhaul. Andrew Davis, an expert in alternative finance who has written reports on the subject for the Centre for the Study of Financial Innovation, says Paypal’s experience is similar to that of peer-to-peer lenders, which have experienced “the strongest growth in niches where banks have either withdrawn or were never that active”. Mr Davis says that these include loans to property buyers and developers, development loans to small housebuilders, short-term advances against individual invoices, “or unsecured small business loans that are bigger than the maximum that banks have ever been happy to lend, which in practice means £30,000-£50,000 depending on the bank”. He says the much quicker credit decisions that alternative lenders often make are beginning to have an impact on the sector. That could all change when arcane-sounding banking rules called PSD2 (European Payment Services Directive 2) come in from next year. This could herald the start of “open banking”, giving consumers and businesses more power on how their financial data is used and shared. Waiting weeks for a credit decision from a bank could soon be a thing of the past.